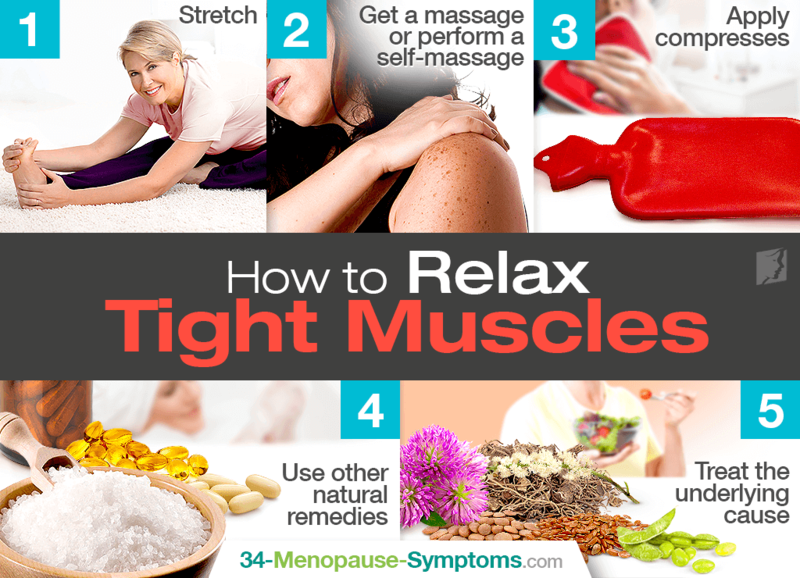 Tight muscles day in and day out can fill everyday tasks and chores with unrelenting soreness, leaving women desperately seeking for how to relax tight muscles for ultimate alleviation. Then, when combined with other symptoms of menopause, women may feel as if they can find no reprieve. Continue reading to find out how to relax muscles to finally indulge in the long-lasting relief for which you have been searching. It might seem counterintuitive to stretch while you're in pain, but one of the best ways to relax muscles is by stretching, which can help reduce initial soreness and tight muscles. The main purposes of stretching are to stimulate blood flow, promote body awareness, improve muscle performance, and help prevent injury and soreness. It is recommended to stretch pre- and post-workout in order to get muscles ready to work and then bring them back to their optimal resting length after exercise. As a matter of fact, yoga poses in particular are renowned for their ability to relax muscles, allowing women to target specific areas with fluidity between the varying yoga sequences. The main purpose of a massage is to improve blood flow, reduce muscle tension, increase tissue healing, and release muscle knots, or small patches of clenched muscle fibers that cause aching and stiffness. How to relax tense muscles begins with these. However, instead of shelling out more than your weekly allowance for such indulgences, consider performing self-massages to release trigger points or asking a family member to help you out. How to relax tight muscles can be as simple as choosing the correct compresses to apply to the affected area. In general, heat compresses are recommended in order to bring more blood to the area where it is applied, thus reducing muscle tightness and stiffness. On the other hand, cold compresses are recommended to reduce swelling and inflammation by numbing the affected area. Ice packs are generally not recommended for those who are suffering from tight muscles. If you're off-put by the idea of using over-the-counter solutions as a way to relax muscles, there are a variety of natural muscle relaxers available to try. For instance, an assortment of vitamins - including the infamous vitamin D and calcium - is necessary for the contraction and relaxation of muscles, helping to relieve any pent-up tightness. For more rapid results, try an Epsom salts bath 10 minutes a day for a week. These natural muscle-relaxing minerals help reduce swelling and relieve muscle cramps and tension with the help of magnesium they naturally contain. For menopausal women, muscle tightness may be due to hormonal fluctuations taking place in their bodies as reproductive functions reach their grand finale. In this case, muscle tension treatments revolve around enacting methods proven to foster hormonal health, which include optimizing one's diet with phytoestrogens, exercising (and stretching) regularly to promote endocrine system health and strengthen muscles, and fostering healthy habits, especially quitting smoking and limiting alcohol consumption. For better results, menopausal women are encouraged to start using alternative medicines, such as phytoestrogenic herbal supplements of black cohosh or red clover, among others, or hormone-regulating supplements like Macafem. Tense and tight muscles don't have to leave you in a bad mood these days. Some of the best ways to relax muscles are within your reach, including effective approaches such as stretching, getting or performing a massage, using alternative methods, applying compresses, or treating the underlying cause of hormonal imbalance in the case of menopausal women. How to relax muscles begins and ends with you; take action today! McAtee, R.E. & Charland, J. (2013). Facilitated Stretching, Fourth Edition. United States: Human Kinetics Publishers. Available from Google Books. There are several herbs that can relieve muscle tension and soothe its underlying causes. Click here to learn about five such herbal remedies.